A few years ago I edited a master’s thesis for Michael O’Meara, a Galway-based chef and photographer. Michael owns Oscars Seafood Bistro, which he runs with his wife Sinéad and a talented team. His thesis won an award for academic excellence, and he was pleased enough with my editing and proofreading that he sent me a testimonial and said he’d be in touch again when he wrote a book. Michael was true to his word. After much research and compilation of material he put together a manuscript, and with the tireless help of the wonderful Connemara publishers Artisan House the results of these efforts are now complete. 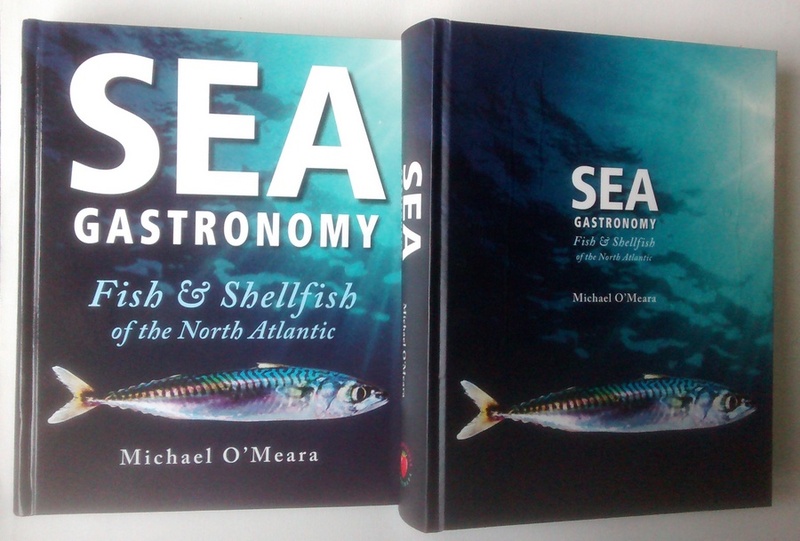 Sea Gastronomy: Fish & Shellfish of the North Atlantic is a prodigious achievement, with 440 pages of recipes, zoological notes, and more, covering 120-odd species (some of them very odd) from the bountiful seas around Ireland. Like many phrases now in common figurative use, with flying colours was literal at first (inasmuch as hanging a flag is literally flying it). But the expression, with its vivid imagery and connotations of success, has obvious appeal, and people duly broadened it to refer to achievements unaccompanied by flag-flying. A related expression, also of naval pedigree, is to sail [or fight] under false colours, synonymous with under false pretences. It refers to an old seafaring trick associated with pirates but not limited to them, who misrepresented their identity by hoisting ‘friendly’ flags, and so were able to get close enough to a target ship to catch its crew unawares. You can read the rest for more on the origins and uses of these metaphors. Some back formations are deliberately comical. Jack Winter’s essay ‘How I Met My Wife’ features such novelties as chalant and petuous (from nonchalant and impetuous); here, the removal of prefixes rather than the usual suffixes gives them a playful feel. Other back formations are obviously redundant, such as conversate, cohabitate, and evolute. The use of these and similar words is likely to invite criticism and complaint – sometimes unfounded, as with orientate. Certain others, such as enthuse, occupy a grey area of acceptability. More often, back formations are developed because there’s a need for them. Surveil is a case in point. See the full post for more discussion and examples of back formation, or my archive at Macmillan for older stuff. A scene from Salthill, Galway, a few weeks ago. It was a bitterly cold evening but the Prom was full of people, many of them like me unable to take their eyes off the changing sky and its play of light on the bay. To regular readers and occasional passers-by: Happy Christmas and a peaceful new year, and thanks for your visits and comments during 2012 – there’d be no Sentence first without them. See you in a couple of weeks, or sooner if you’re on Twitter and I pop in over the break. P.S. Feel free to use the comment form to pose queries, suggest ideas for future posts, tell me what you’re reading, and so on.